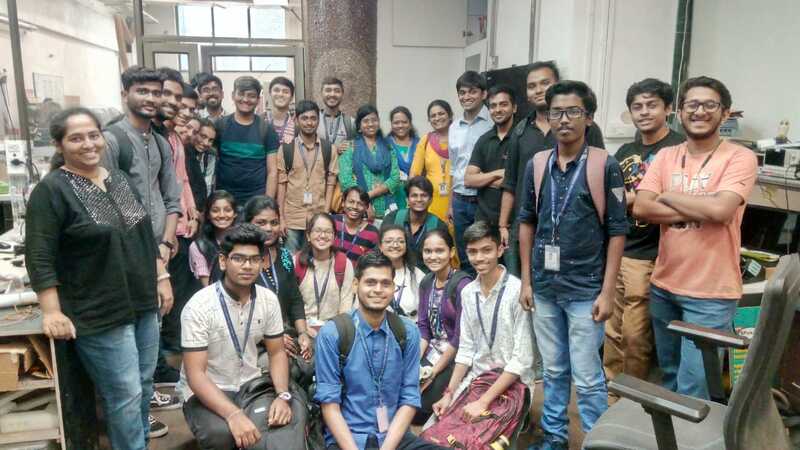 Department of Electronics Engineering, in collaboration with “ISTE SAKEC Student Chapter” organized an Industrial Visit to “Tata centre for Technology and Design,IIT Mumbai ” on Wednesday 20th March 2019. SAKEC alumni, Mr. Zubin Savla is a Project Research Engineer at Tata centre for Technology and Design,IIT Mumbai . Mr Zubin Savla gave information about 3D printer,Cutting tools,PCB design etc.The visit was coordinated by Prof. Manjusha Kulkarni. 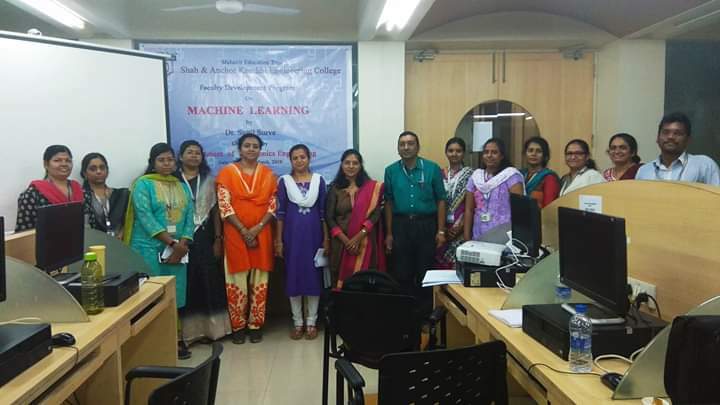 Department of Electronics Engineering organized an FDP on Machine Learning on 2nd and 16th March 2019. 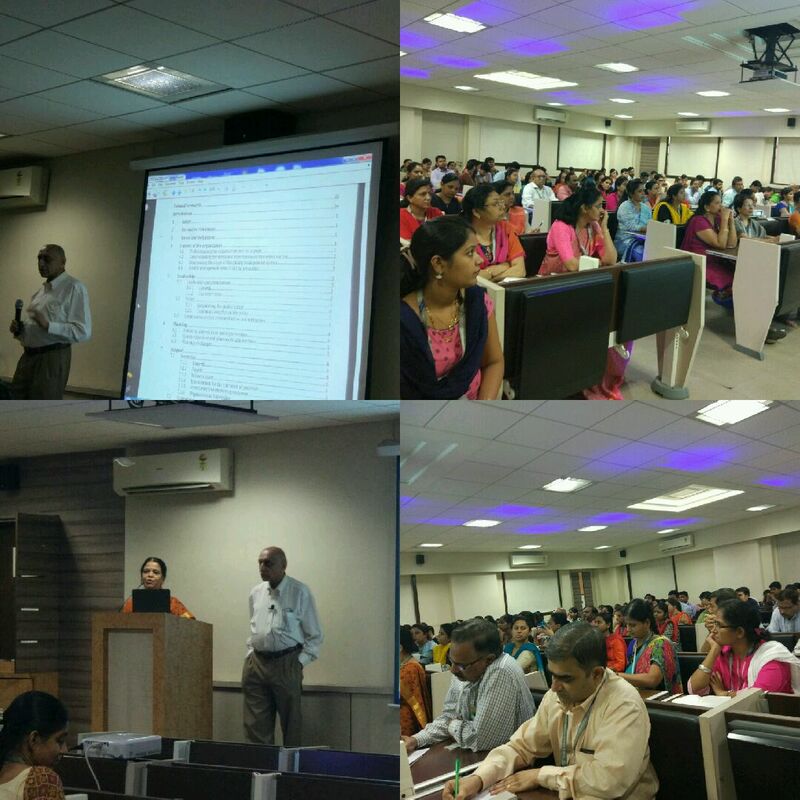 The FDP was conducted by Dr.Sunil Surve, Prof.Dipali Koshti and Prof. Supriya Kamoji of Fr. Conceicao Rodrigues College of Engineering, Bandra Mumbai and coordinated by Prof. Nandkishore Narkhede. Department of Electronics Engineering in collaboration with SAKEC-ACM Student Chapter organized a seminar on How To Do End To End Innovation on Wednesday 6th February 2019. 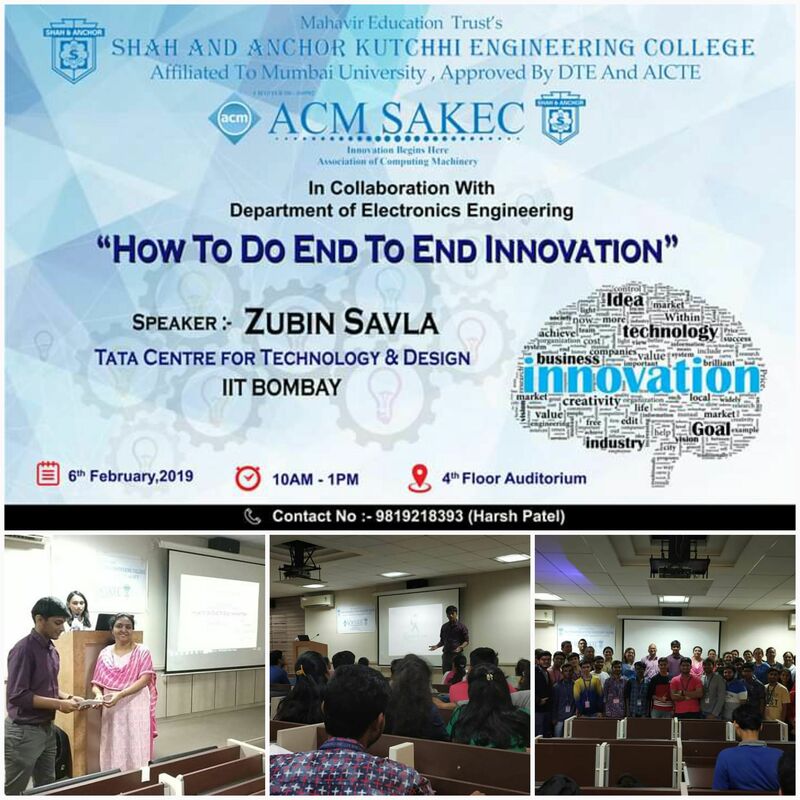 The Seminar was conducted by SAKEC Alumni , Mr. Zubin Savla ,Tata Centre for Technology & Design, IIT Bombay and co-ordinated by Prof. Manjusha Kulkarni from Electronics Engineering Department. The programme was intended for Second year and Third year Electronics engineering students. 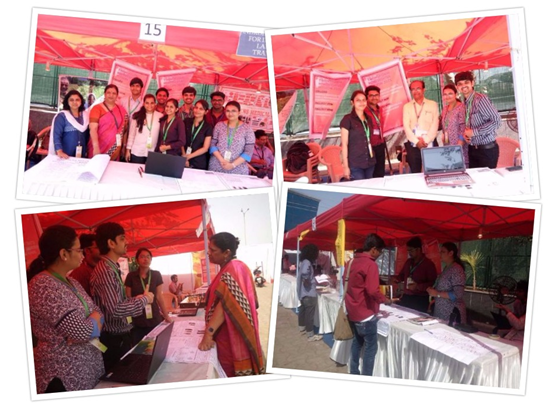 The participant got ample of exposure to all stages of product development, starting from concept to the end product. 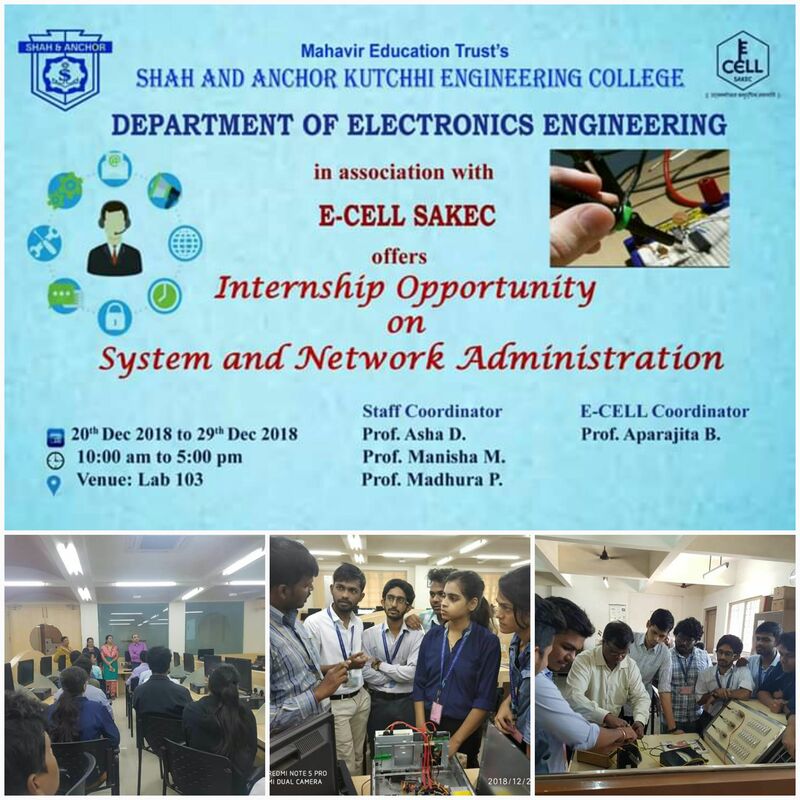 An Internship Program on System and Network Administration was held from 20.12.2018 to 29.12.2018 by Department of Electronics Engineering in association with E-Cell SAKEC. 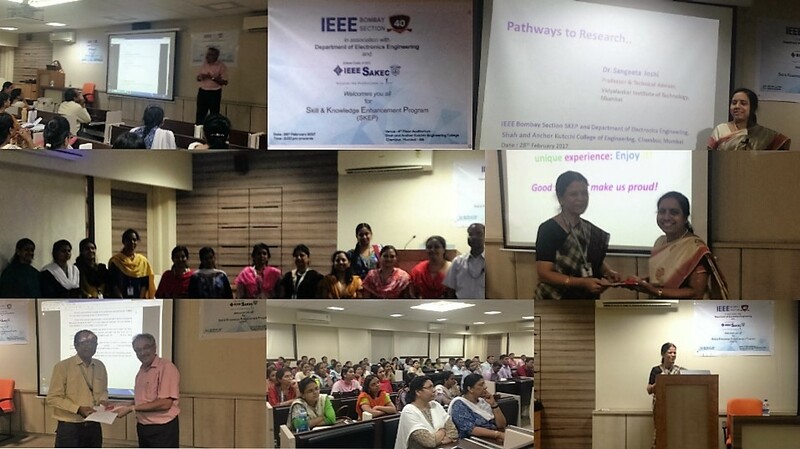 The program was coordinated by Prof. Asha Durafe, Prof. Manisha Mane and Prof. Madhura Pednekar, ETRX Department, SAKEC. This internship program aimed at giving Hands On training to the students. Students were given an opportunity to learn and do system administration and work on live project. On successful completion, the participants were awarded with an Internship certificate.Six students are shortlisted for the industry internships starting from 31st December 2018. 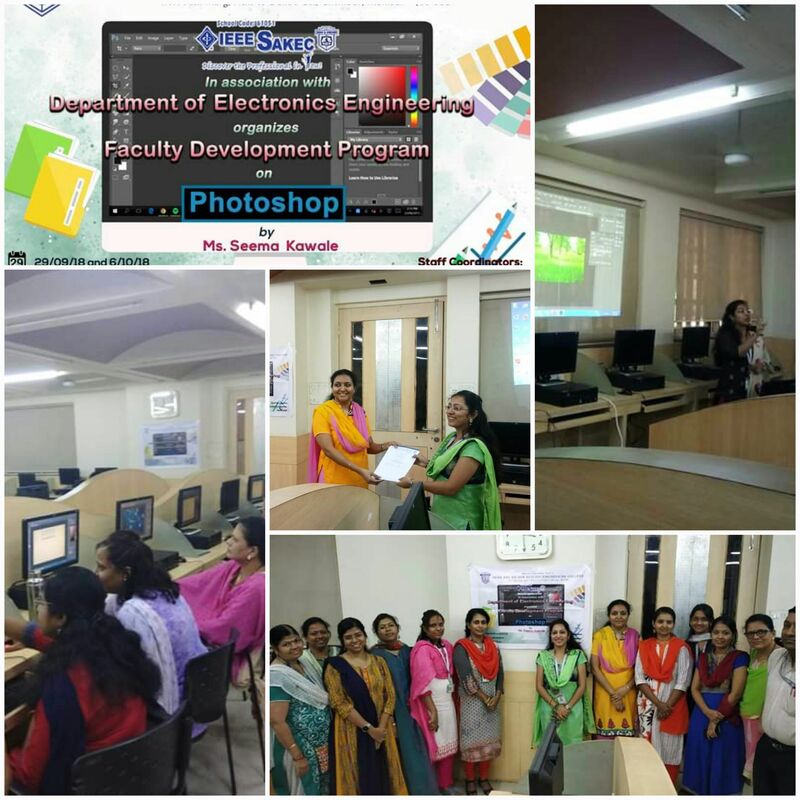 A faculty development programme on “Introduction to Photoshop” was held on 29.9.2018 and 6.10.2018 by Department of Electronics Engineering in association with IEEE-SAKEC. Speaker of the event was Prof. Seema Kawale,Assistant Professor, EXTC Department, SAKEC. Topics covered were Photoshop hands on training and making banners,certificates using Photoshop. The event was a great success with gained knowledge and training in Photoshop. 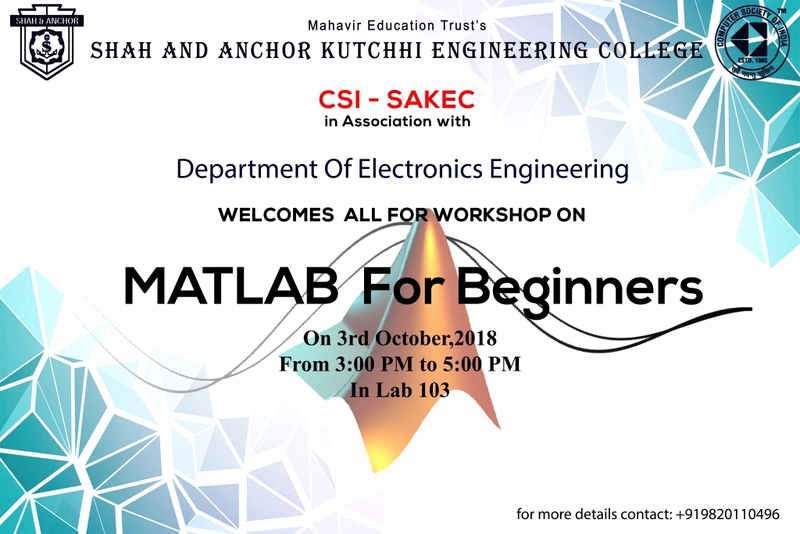 CSI SAKEC in collaboration with Electronics Engineering Department had organised a hands on workshop on MATLAB. 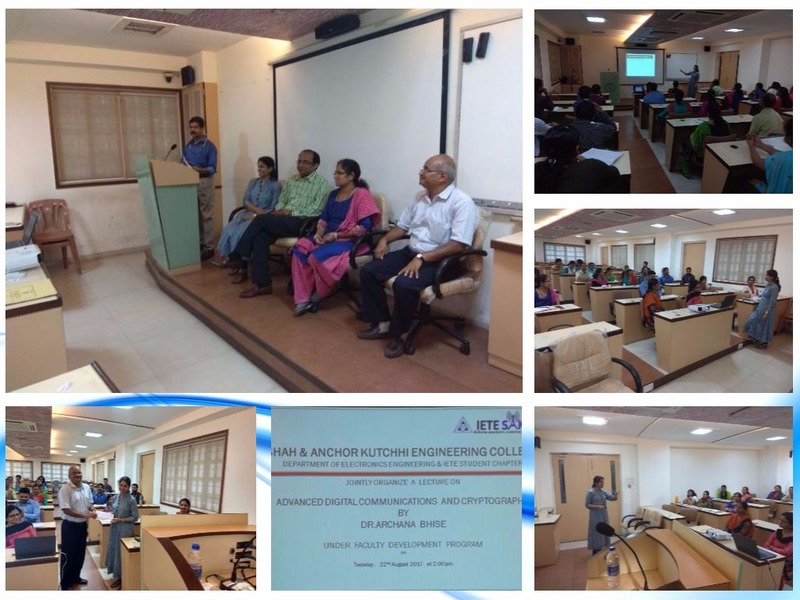 The workshop was conducted by Prof. Manisha Mane from Electronics department. The workshop started with the basics of MATLAB and then the speaker highlighted the use of MATLAB and its applications. The workshop covered different mathematical functions and user defined functions. 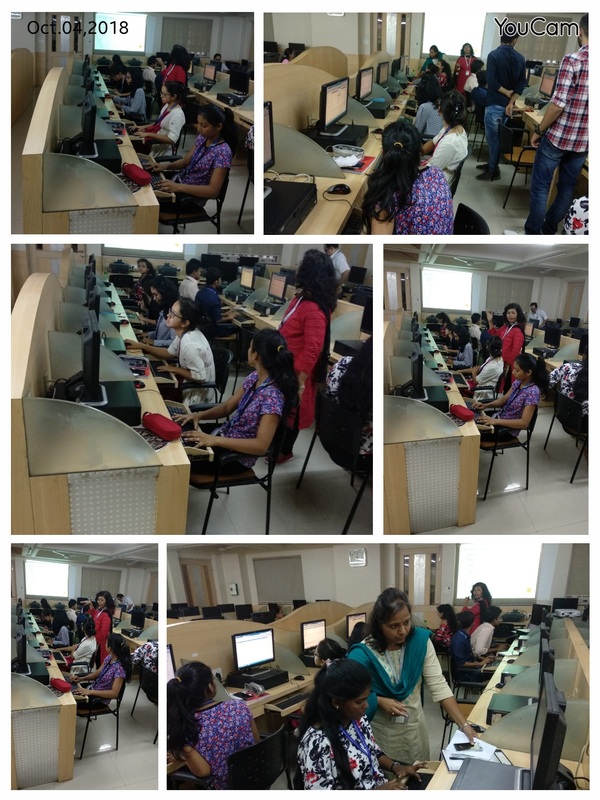 Participants enjoyed hands on experience on array operations and then the session ended with the importance of Simulink in the design of systems. So participants understood the importance of MATLAB in academics. The event was attended by 31 participants from third-year electronics department of SAKEC. The students were greatly benefited by various normalization forms taught to them in a very interactive manner. The response and engagement during the event from the participants showed that they fully understood the topics taught to them. 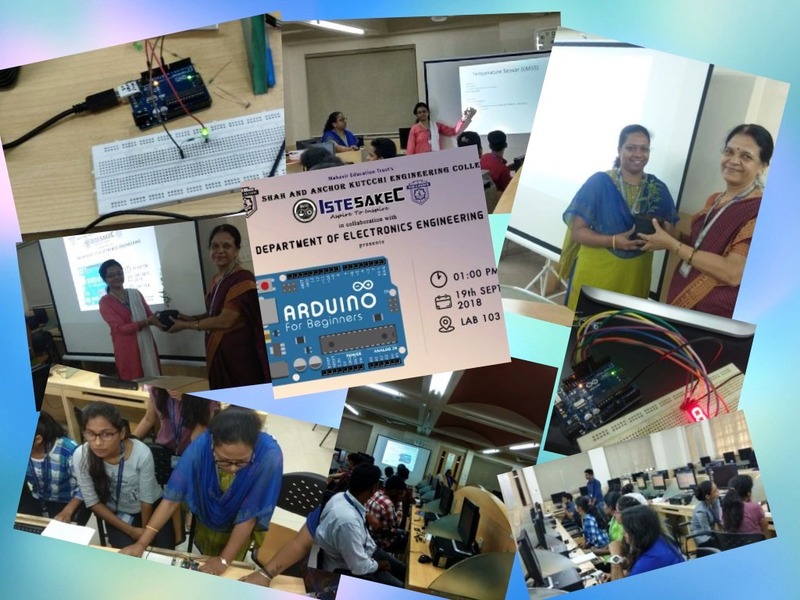 ISTE SAKEC in collaboration with Department of Electronics Engineering had organized a hands-on workshop on “ARDUINO FOR BEGINNERS” on 19th September 2018 in Lab 103. The workshop was conducted by Prof. Shubangi Motewar and Prof. Madhura Pednekar. The speakers gave extensive knowledge of Arduino to the participants during the workshop. A number of topics were covered during the workshop. 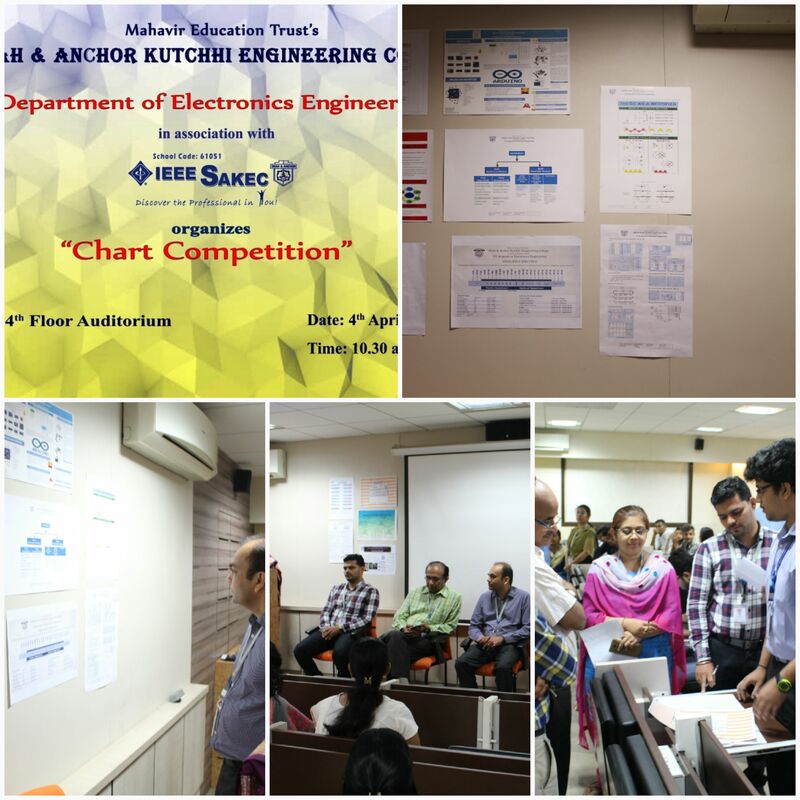 Department of Electronics Engineering in association with IEEE SAKEC had organized “Chart Competition” on 4th April 2018 in 4th floor auditorium. Students of SE and TE Electronics have participated in this event. They made charts based on their syllabus. The Judges for this event were Prof.. Swati Nadkarni(I/c HOD, IT ) and Prof. Rohan Borgalli (EXTC Department). These charts will be displayed in the respective laboratories. 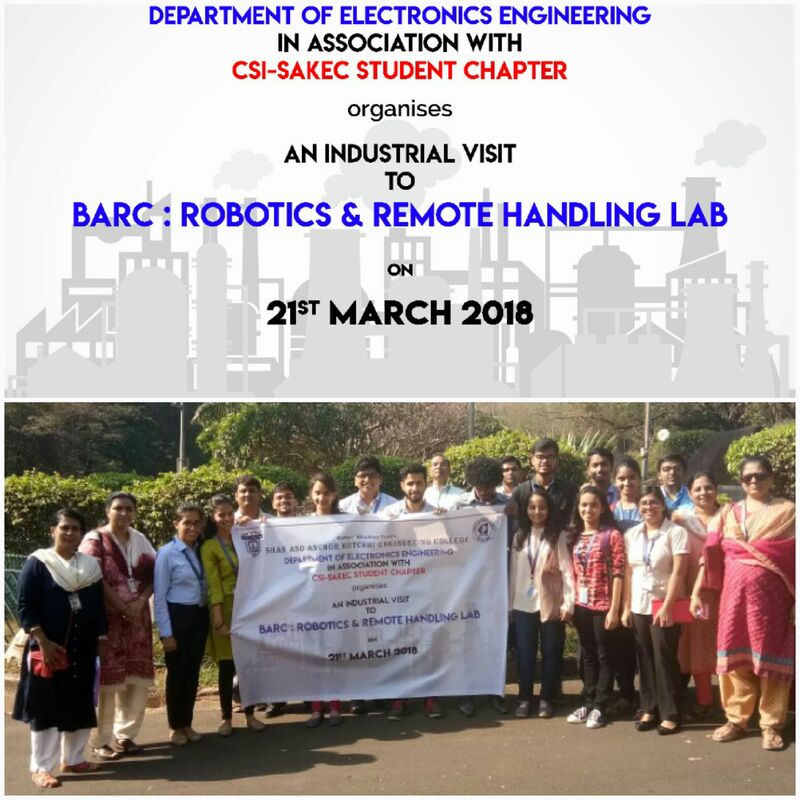 We visited the Remote Handling and Robotics Lab, Food Irradiation and Super Computing Technology lab. The research undertaken at each of the facility was explained by the concerned scientists. Interacting with eminent scientists of BARC was really a wonderful experience for faculty and students. The visit was coordinated by Prof Salabha Jacob of Electronics Engineering Department. Department of Electronics Engineering in association with IETE SAKEC had conducted a Faculty Development Program on ‘Introduction to Python programming’ on 26th February 2018. 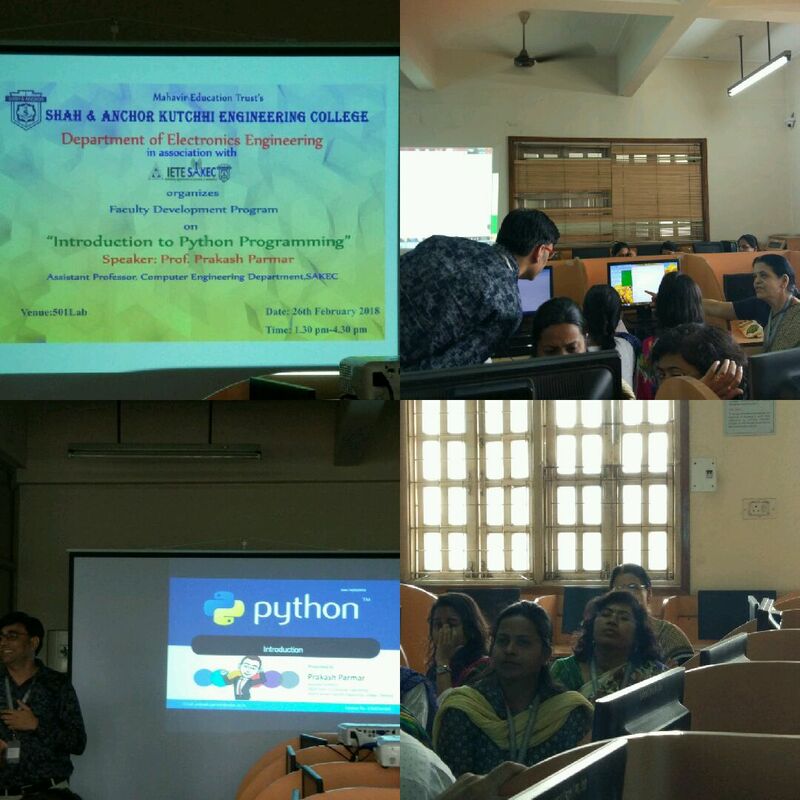 The speaker, Prof. Prakash Parmar from Computer Engineering Department, SAKEC successfully conducted an extensive hands-on session and enlightened the faculties about the basic knowledge of the Python programming language. We are happy to announce that our management has purchased campus license of Matlab. 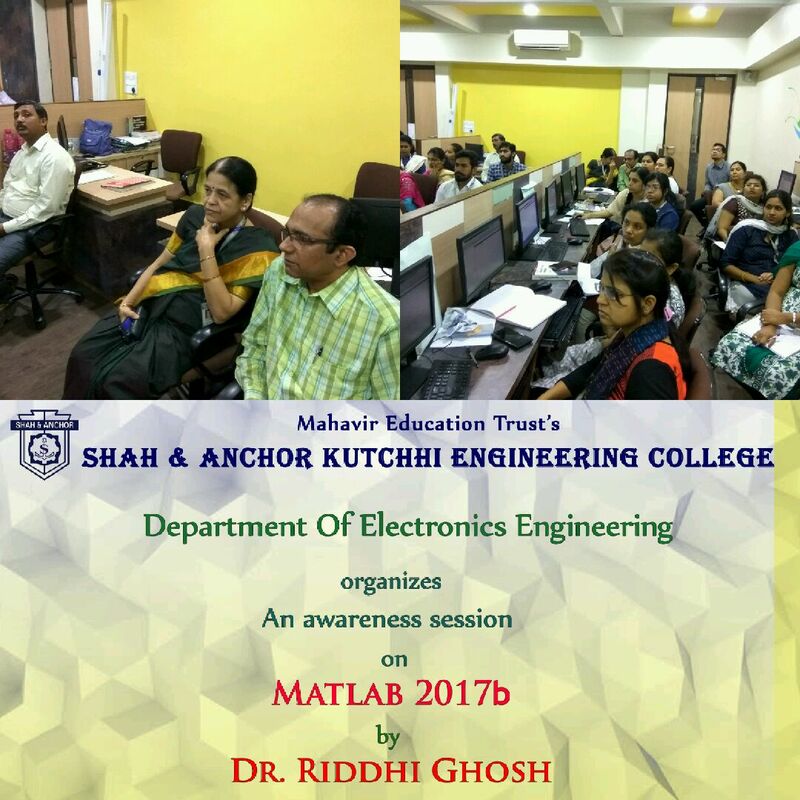 In view of this,Under Department of Electronics Engineering, an awareness session was conducted on 12 th Feb,2018 by Dr Riddhi Ghosh of Mathworks for our faculty members. Around 40 faculties from various departments attended the session. An ISO 2015 awareness lecture was arranged by Department of Electronics Engineering on 21st February 2018 between 12:30 pm to 1:30 pm.The ISO expert Mr. Dave delivered the lecture. It was attended by more than 110 staff members of SAKEC. Ms. Sarika Bukkawar and Ms. Jayashree Bhole coordinated this event. Workshop on the Internet of Things: IomaTics. ACM SAKEC in association with the department of Electronics organized a 3 days workshop on the Internet of Things: IomaTics. The speaker of the event was Mr. Nilesh Sahare from ANV INFOTECH PVT. LTD. 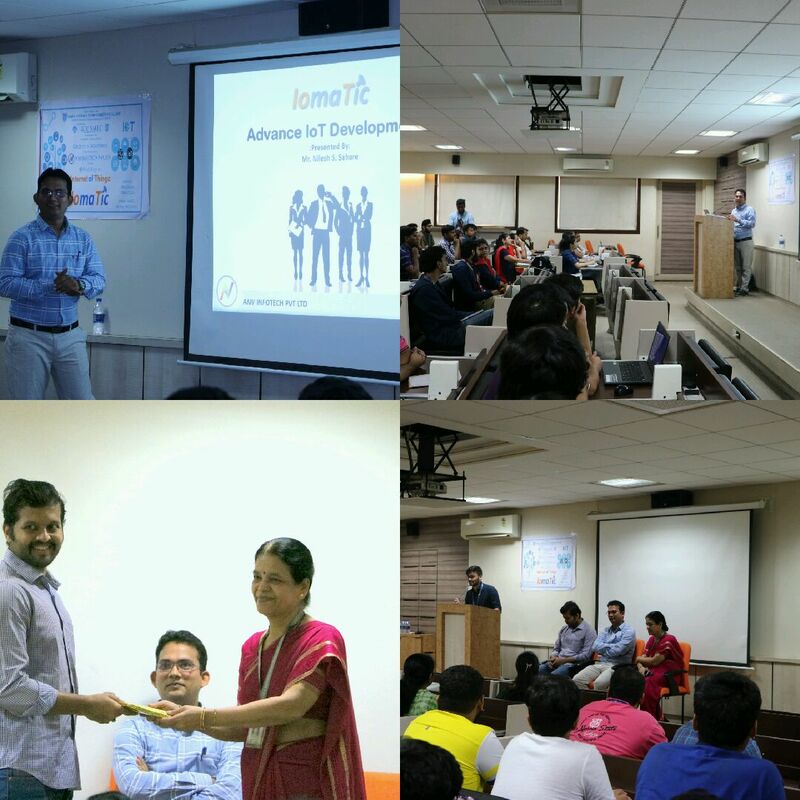 The workshop was conducted to make the students aware of the IoT Technologies and to have them hands on experience of IomaTic board. Mr. Nilesh Sahare explained the students that how a single click IomaTic board can be converted into real life applications. Department of Electronics Engineering organized an Faculty Development Program on Simulation and Modelling of Molecular Communication based Nano Networks on 3rd Feb 2018. The speaker of the event was Dr. Prachi Raut, Associate Professor, SFIT, Borivali. The event was coordinated by Prof. Sarika Bukkawar. Department of Electronics Engineering in association with ISTE SAKEC organized an industrial visit at L&T Marine, Rabale on 7th Oct 2017. 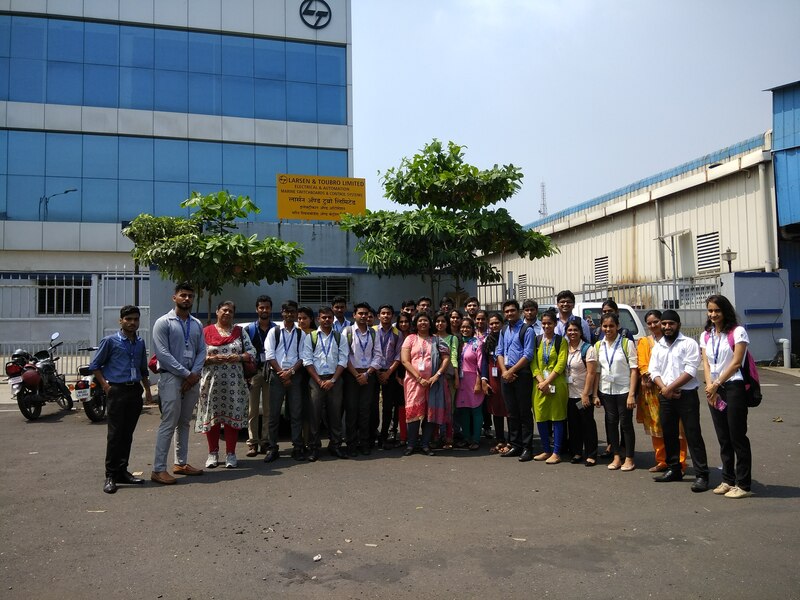 Mr. Vijay Mahajan at L&T with his supporting staff enlightened the students about the knowledge of submarine panels assembled in their premises. The students visited the switchgear and control section along with the UPS section which is used in Indian submarines. FDP on xR- Transforming Physical & Digital World! 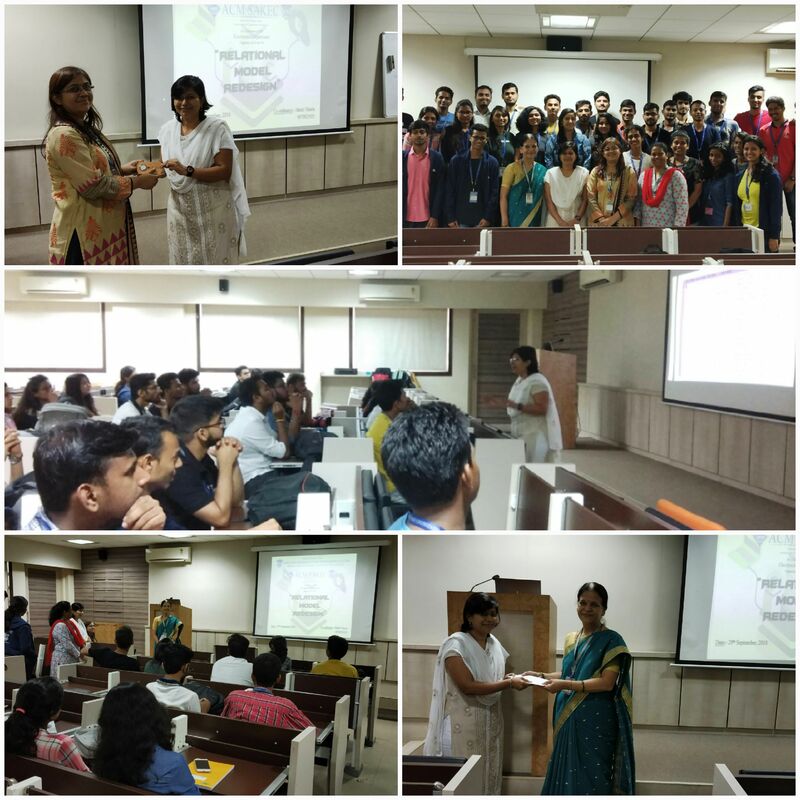 Department of Electronics Engineering in association with IETE Students Chapter SAKEC successfully conducted FDP on ‘Advanced Digital Communications and Cryptography’ on 22nd August 2017, by Dr. Archana Bhise. 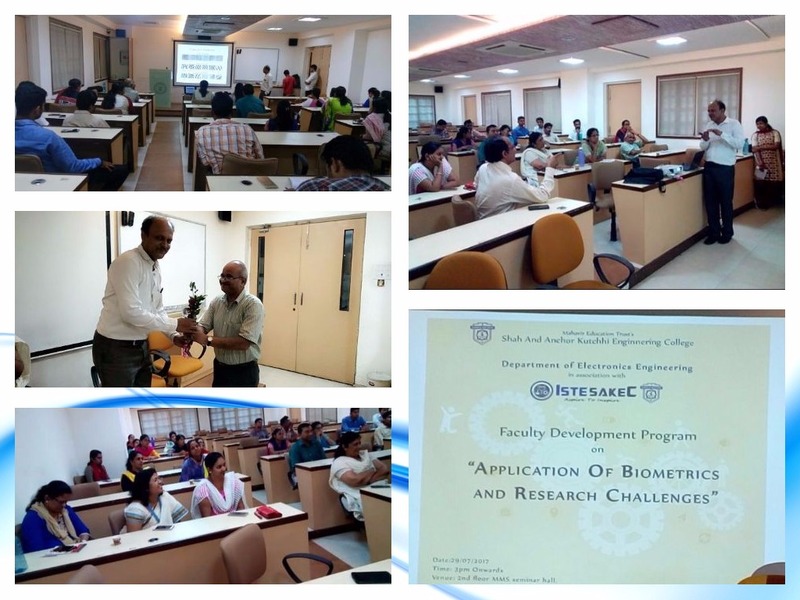 Department of Electronics Engineering in association with ISTE SAKEC successfully conducted FDP on ‘Biometric Applications and Research Challenges’ on 29th July 2017. Prof. Parmeshwar Birajdar enlightened the audience with the knowledge of different aspects of Biometric field, its application and research areas. An intra college project competition- PROJECT HUNT was organised by the Department of Electronics Engineering of Shah and Anchor Kutcchhi Engineering college on 21st April 2017 to showcase innovative ideas of students on a common platform. Groups from all the departments actively participated making the event a true success. The event was judged by the senior faculty members of respective departments. 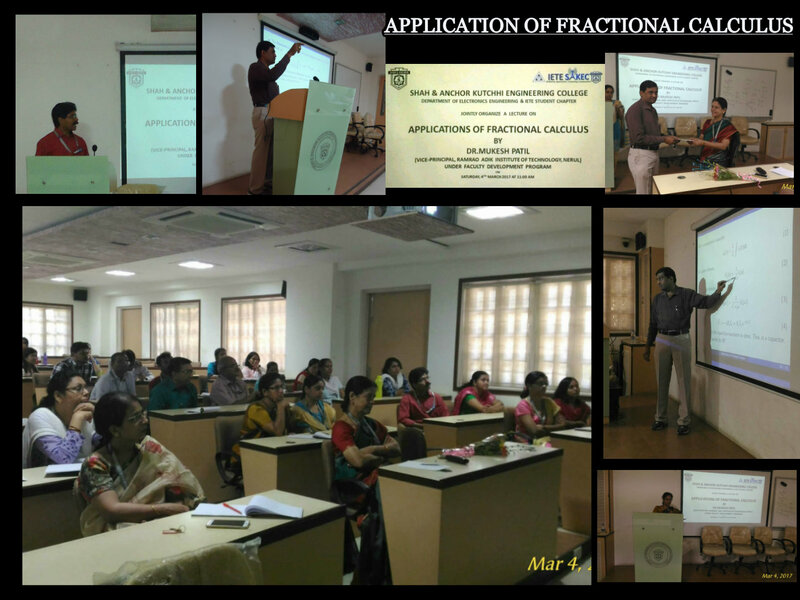 Department of Electronics Engineering and IETE SAKEC organized an event on “Application of Fractional Calculus” On 4th March 2017, The event took place at SHAH AND ANCHOR KUTCHHI ENGINEERING COLLEGE on Second floor, MMS section Auditorium. 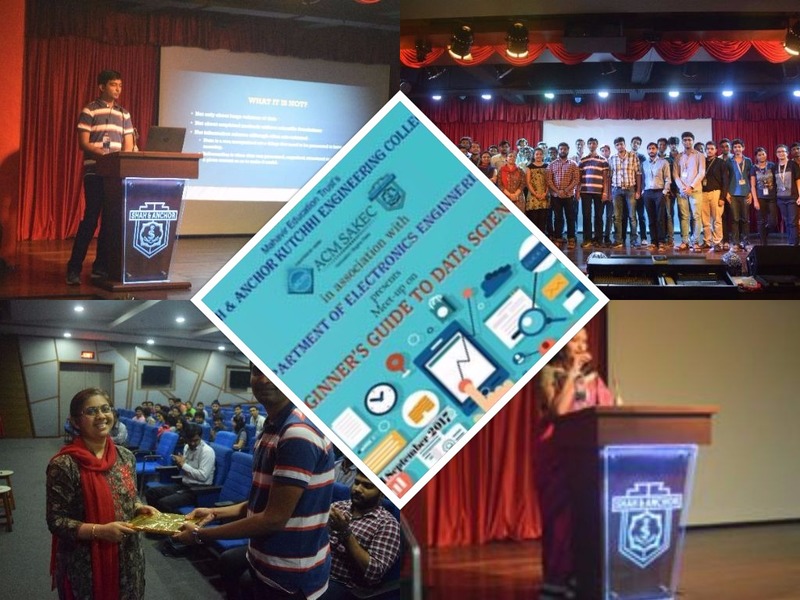 The event was specially for all teaching faculties from Electronics and Electronics and Telecommunication Department.The speaker in the event was Mr.Mukesh Patil,Vice Principal, Ramrao Adik Institute of Technology, Nerul. IEEE Bombay section in association of Electronics Engineering department , SAKEC and IEEE SAKEC organized Skill & Knowledge Enhancement Program(SKEP) in shah and Anchor Kutchhi Engineering college on 1st March 2017 from 2 pm to 5 pm. 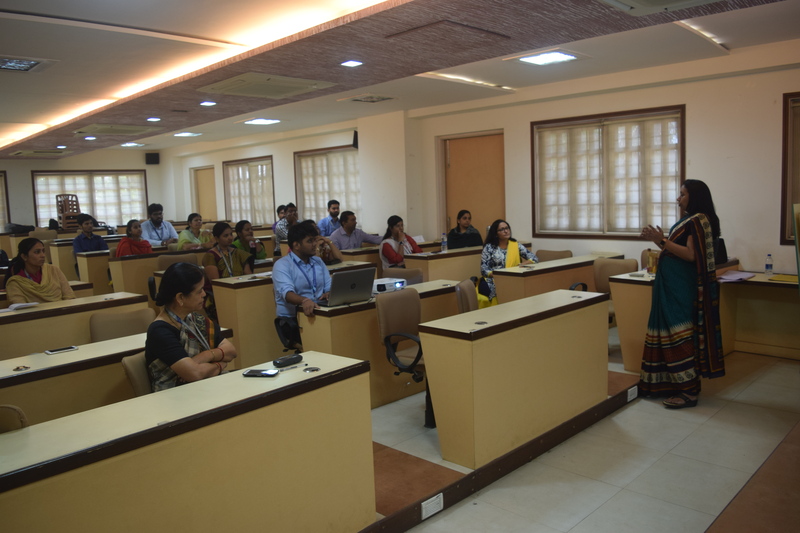 This SKEP had two session out of which first session “Pathway to research” was conducted by Dr. Sangeeta M. Joshi who is Technical Advisor in Vidyalankar Institute of Technology. Second session “Research methodology” was conducted by Dr. R.G. Karandikar who is working as a Professor in K.J. Somaiya college of Engineering. 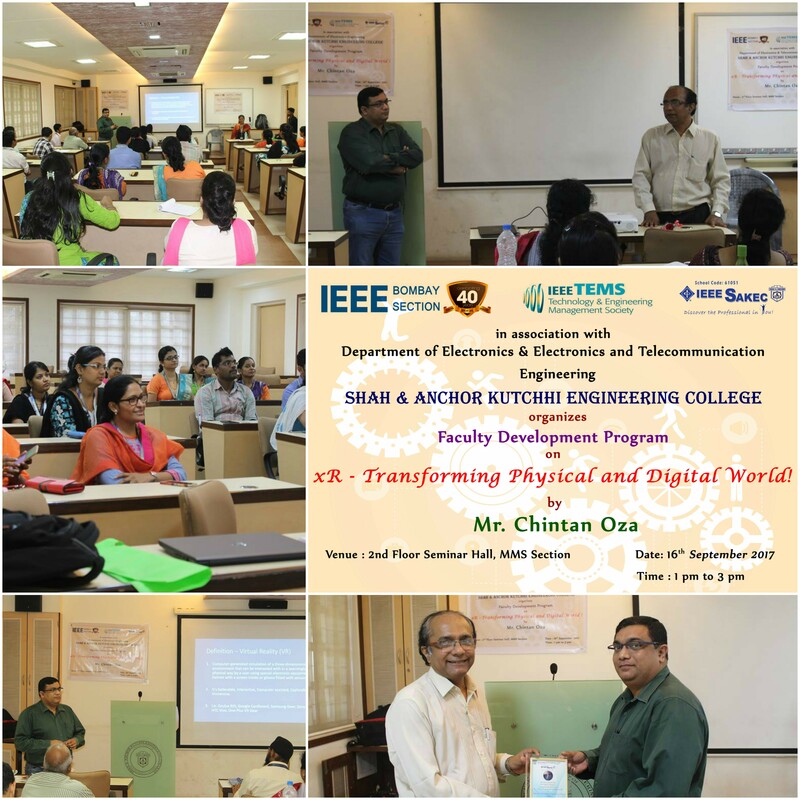 The external faculties from various colleges and faculties from all the departments of Shah and Anchor Kutchhi engineering college attended this SKEP event. This SKEP sessions are specially organized for the participants who wants to pursue PhD.